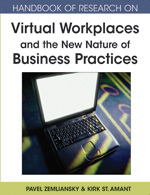 This chapter explores the potential of an educational commons to help schools better prepare students for the virtual workplace. Together with the formation of stronger linkages between schools and the business world, making greater use of resources such as open source software in both school and business would greatly reduce costs and enable students to be better prepared to participate in the virtual workplace. With the virtual workplace’s emphasis on online communication technologies as a primary tool for completing day-to-day tasks, schools must acquire the hardware and software as well as explore ways of incorporating these tools into the student learning. To reduce the expense of doing so and to ensure that the environments in which students learn reflect that of the workplace, both organizations should consider using more accessible software and working more closely together. Conceptualizing the ideal learning environment as an educational commons, this chapter will explore open source resources and their potential contribution to education and some of the opportunities as well as the challenges that will be encountered as open source resources are introduced to education and business. Educational Commons: The idea of an educational system that strives to ensure that resources for teaching and learning are freely available to teachers and students without connections, permissions, or access granted by others. These resources are thought of as a “commons”. Commons: A wide array of creations of nature and society that we inherit freely, share, and hold in trust for future generations ( Bollier, 2003 ). Groupware: a Web-based technology designed to facilitate the work of groups. This technology may be used to communicate, cooperate, coordinate, solve problems, compete, or negotiate. Open Source Software: Generically, open source refers to a program in which the source code is available to the general public for use and/or modification from its original design free of charge. Open source code is typically created as a collaborative effort in which programmers improve upon the code and share the changes within the community. For a more technical definition visit the Web site of the Open Source Initiative (2007 AU12: The in-text citation &quot;Open Source Initiative (2007&quot; is not in the reference list. Please correct the citation, add the reference to the list, or delete the citation. ). Market Enclosure: The process through which resources held in common for all to use are gradually being taken over by corporate interests ( Bollier, 2001 ). Learning Management System or LMS: A software package that enables planning, delivery, and management of all learning events within an organization, including online, virtual classroom, and instructor-led courses.